Diane Arbus. 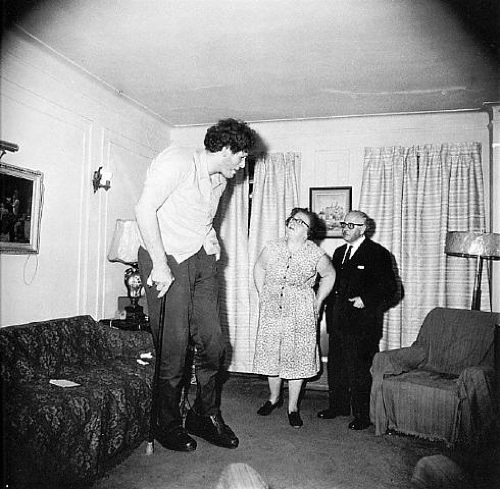 A Jewish giant at home with his parents, in the Bronx, N.Y., 1970. Eddie Carmel was the son of immigrants from Tel Aviv. He worked as a main attraction in a circus in New York, as “The World’s Tallest Man”. Eddie Carmel started suffering from acromegaly (a condition in which the body produces too much growth hormone) when he was fifteen, due to an inoperable pituitary tumor. His condition got worse over the years, and in order to break his isolation, he started to work in show business. Diane Arbus met Eddie in 1960, ten years before the famous picture, which was the centerpiece of an exhibition at the Jewish Museum in New York last year. A close read of the story can be read in Arthur Lubow’s article. Patricia Bosworth comments in “Diane Arbus – a biography” about the early fascination of the photographer with variations of body and biology – like purple birthmarks, albinism, identical twins, triplets, dwarfism. According to Arbus: “I really believe that there are things nobody would see if I didn’t photograph them”. 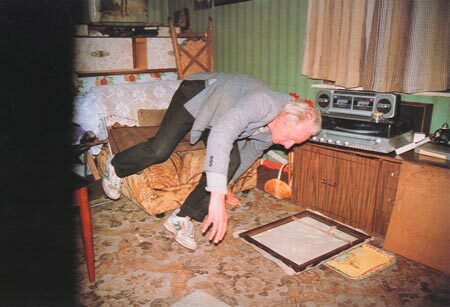 Richard Billingham (Birmingham, 1970) is an English photographer and artist who became well known after his photo-book ‘Ray’s A Laugh’ (1996). 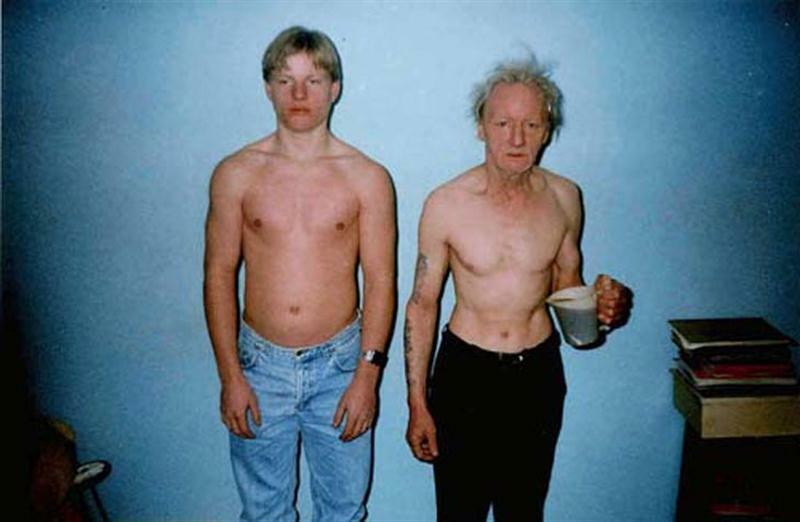 The book shows private snap shots of his alcoholic father Ray, of his heavily tattooed and obese chain-smoker mother, Liz, and of his unruly brother. 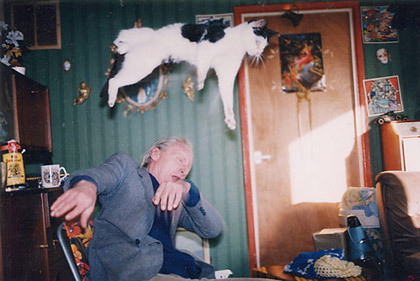 “My dad had moved into my mum’s place by this time and I could not believe how it looked. 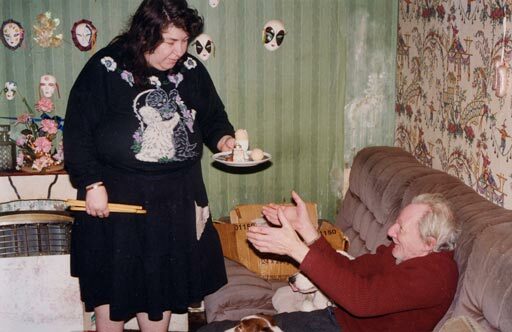 She’d had two years away from my dad so she had created her own psychological space around herself that was very ‘carnivalesque’ and decorative. There were dolls, jigsaws everywhere. 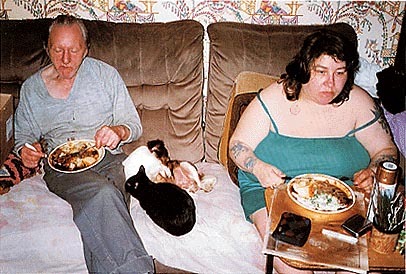 She’d got load of pets by this time; she had about ten cats … two, three dogs.” (Richard (Billingham, In: ‘We are family’, Genius of Photography).